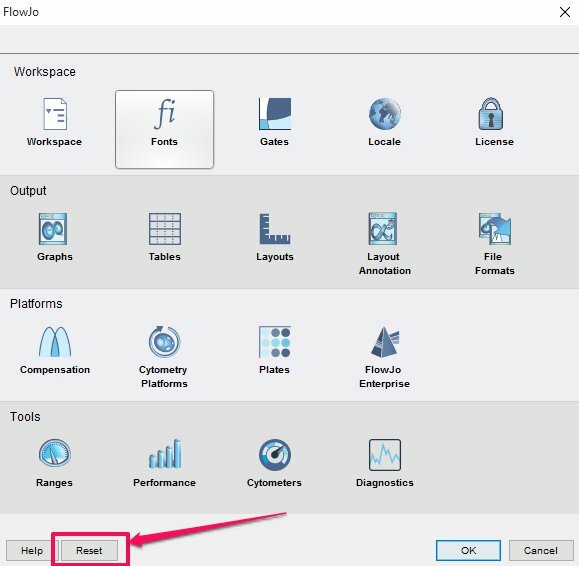 To reset Preferences to factory default: Open Preferences by clicking on the heart icon in the upper right corner of FlowJo. Figure 1. The Heart Icon. Use the Reset button in the lower left hand corner to set the configuration file for FlowJo to its default settings. Click ok in the confirmation dialog to confirm reset to factory defaults. Figure 2. Resetting FlowJo to factory default preferences. If you are unable to start FlowJo , please contact customer support.